At Christchurch School, we combine 100 years of tradition, community, and relationships with a dynamic and innovative approach to learning that meets each child where they are and prepares them to succeed in a rapidly changing world. "Many students begin high school with a self-understanding that's narrow - 'I'm a lacrosse player,' 'I'm a good student,' or sometimes, 'I just don't fit in.' At Christchurch, we help students realize their potential isn't limited to just one box. The Christchurch hallmark isn't our unique curriculum, our many sports championships, or our beautiful campus. It's the graduate who leaves Christchurch a larger person than when he or she came in, a graduate who can do well academically, professionally, and socially at any college, in any profession, or at any place in the world. That's the real goal of a Christchurch education." A place to create, invent and learn ... our refreshed and re-imagined Makerspace is a hive of engineering, collaboration and creativity in the center of campus. 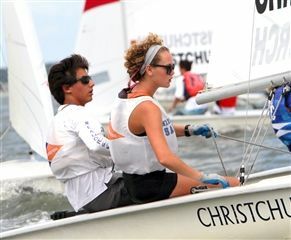 Our sailors are the 2016 Atlantic Coast champions, and sophomore Boyd Bragg was named Virginia Interscholastic Sailing Association's (VISA) Sailor-of-the-Year! The Clyde V. Kelly IV Sailing Pavilion at our waterfront is home to the team and our brand new fleet of Collegiate/High School ZIM FJ sailboats. Did you know that one oyster can filter 50 gallons of water each day? 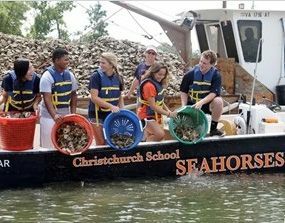 CCS students cultivate oysters at our waterfront farm. Some oysters go to market, others remain in the Rappahannock to clean water as it enters the Chesapeake Bay. "It's about deepening our connection with and understanding the international community. It's integrating international trips with classrooms. It's about exploring and pursuing opportunities to connect with other parts of the world in meaningful, curriculum-driven ways." AN EXCELLENT EDUCATION ISN'T LIMITED TO ACADEMICS. CHRISTCHURCH'S CO-CURRICULAR ACTIVITIES SUPPORT AND COMPLEMENT THE ACADEMIC PROGRAM, WHILE CREATING BALANCE FOR STUDENTS BY ENCOURAGING THEM TO DEVELOP INTERESTS OUTSIDE OF SCHOOLWORK. "Every week, sit down and have lunch with one fellow CCS student (or faculty member) who you don't yet know well. If you are a junior or senior, sit down with a freshman and find out his or her story, likes and dislikes. Can you imagine if you had that senior or junior you always looked up to as a freshman invest a little time and energy getting to know you? If you are a freshman or sophomore, be a leader and invite one of your fellow classmates to a one-on-one for lunch. Not only will this strengthen your bonds with peers and faculty members, but it will also improve your ability to articulate your thoughts and ideas. 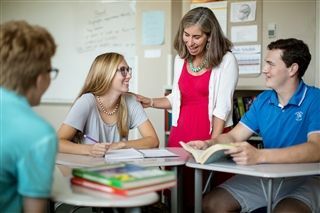 Developing the ability to have a meaningful and sincere conversation with someone will invaluable throughout your journey at CCS and onward." "Do everything you possibly can! Experience things that you never have before because that will make you a well-rounded person. Become friends with everyone because once you get to the real world, it's very important to know many people because you never know what or who you might need." "Try new things!" Get to know your teachers - these will be relationships that you will cherish forever. Find what interests you. Play a sport, even if you're not athletic - it will teach you lessons about teamwork, dedication and hard work. Best advice? Do what you HAVE to do now so you can do what you WANT to do later. Do the groundwork now so that you have opportunities available for you later. This means that if you want to play sports in college, work and train hard now so that can be an option for you later. If you see yourself at an Ivy League school, then work hard on grades throughout all of school. You can't have one semester of good grades to get into a school like that." "Have an open mind and really get to know each other well! By the end of the four years, those in your class will be like a second family. There are so many opportunities to do different and cool things that no other high school students in the nation are doing."